Most Apple hardware comes with a one-year limited warranty and up to 90 days of complimentary telephone technical support, which is provided by AppleCare. The goal is for an Apple expert to resolve customer issues with just one phone call to AppleCare. Most of AppleCare's home-based customer service jobs, called Apple At Home Advisors, are virtual call center positions (which includes chat). Apple At Home Advisor jobs are full- or part-time employment positions in a call center, not as independent contractors. As the customer's first point of contact, Apple At Home Advisors assess issues and troubleshoot. Apple hires both permanent and temporary (seasonal) work-at-home employees. The company also hires home-based call center managers to oversee the At Home Advisors. Student positions are part-time during school sessions (minimum of 16 hours a week) and full-time during breaks and summer. Non-students must commit to 20 hours a week with the possibility of more or less depending on needs. Because of high customer demand on holidays (especially Christmas), AppleCare call center agents must be available to work holidays. Advisors work varied shifts on a seven-day schedule, including nights and weekends. Training can last between five and seven weeks, according to Apple's website. Advisors train from home, accessing instructors via a virtual environment. They learn about Apple products, troubleshooting, customer support, and the job's tools and processes. For non-students applying for these positions, two years of experience in technical troubleshooting (in-person or on the phone) is required. Both students and non-students need experience with the iOS, smartphones, tablets, PCs or Macs. According to Apple, an At Home Advisor should be "passionate about technology and experienced with computers," have good people skills and be able to work independently. Student applicants must be currently enrolled on the campus at which Apple is recruiting and have a 2.7 cumulative GPA. A criminal background check is required for all applicants, and for those applying for the chat positions, typing of 40 words per minute is required. 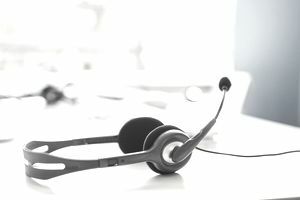 Apple's office requirements differ from the typical home call center office requirements because it provides not only a computer to its call center agents but a headset as well. However, it does require a room with a door to keep out noise, a desk, an ergonomic adjustable chair, a dedicated telephone line, and an Internet connection meeting certain requirements. While the main focus of the Apple At Home program is the United States (hiring in more than 30 states), Apple also occasionally recruits for this program in Toronto, Canada; Cork, Ireland; and Sydney, Australia. At one time an Apple At Home Advisor's home office had to be within 100 miles of the city designated in the job description; now, though, it will hire for these positions from anywhere in the United States. However, its college program for At Home Advisors still only hires from specific college campuses. To find Apple At Home Advisor jobs, either go to the Apple At Home Advisor web page or search Apple's corporate jobs database. The Apple At Home web page provides links to access to the non-student U.S. positions, while the corporate jobs site lists all. Use "home" as a keyword to search the database or sort the job categories as "Customer Service and Support." What will you make at this job? Apple doesn't disclose salaries or hourly pay on its website, other than stating that "all salaries are competitive" and "discussed during the recruiting process". In November 2018, Glassdoor.com reported that "the national average salary for an Apple At Home Advisor is $30,540 in United States". Others have reported an hourly wage of anywhere between $13 to $16 an hour.